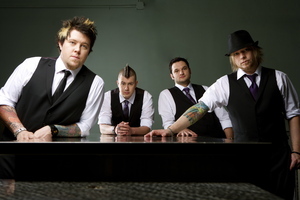 12 STONES–Paul McCoy (vocals), Eric Weaver (guitars), Justin Rimer (Guitar), Michael McManus (drums)–will release their fourth album, ONLY HUMAN, August 23 on the Executive Music Group label via Fontana/Universal. The band joined forces once again with producer Skidd Mills (Saving Abel, Skillet, Saliva), who had previously worked with 12 STONES on 2007’s ANTHEM FOR THE UNDERDOG, which was inspired by the effects of Hurricane Katrina on their hometown of New Orleans. The first single and video from ONLY HUMAN—which was mixed by Mike Shipley (Green Day, 30 Seconds To Mars)–will impact radio and be available next month. Stay tuned for further album details and news about the band’s forthcoming summer tour.